Sleep apnea is a sleep disorder characterized by interrupted or shallow breathing during sleep. Pauses in breathing can last anywhere from a few seconds to a few minutes, and may occur repeatedly throughout the night. During these repeated pauses, the body—particularly the brain—doesn’t receive enough oxygen, while at the same time increased carbon dioxide levels. As a result, sleep apnea is potentially a life-threatening and even life-ending condition if left untreated. Complicating matters is the fact that many people with sleep apnea are often unaware that they have it. Often, it’s a close family member, such as a spouse, who informs the sleep apnea sufferer of their sleep disorder. The family member may observe, for example, that an individual with sleep apnea will struggle to breathe at times while sleeping, resulting in loud snoring or choking. 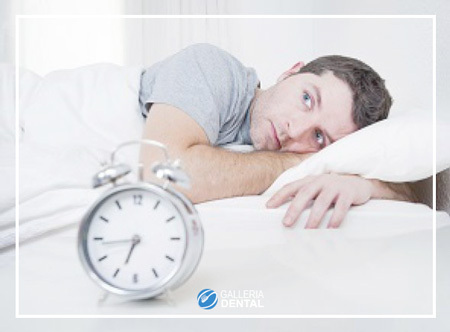 While sleep apnea can be an annoyance for others, fortunately it can be treated by sleep apnea dentistry if it’s detected early. What are some common forms and risk factors of sleep apnea? The two most common forms of sleep apnea are obstructive sleep apnea (OSA) and central sleep apnea (CSA). OSA is the more common of the two sleep apnea types and is commonly caused by a blockage of the airway that restricts breathing. By contrast, CSA results from instability in the respiratory control center that fails to send a signal to the brain to breathe. Risk factors for obstructive sleep apnea include being overweight, being over the age of 40, having a family history of the condition, or having a large tongue or tonsils. Common signs of OSA include severe early morning headaches, daytime fatigue or lack of concentration, and insomnia. Should you or someone you know exhibit these key signs or symptoms, you may want to consider visiting a sleep apnea dentist in Houston. What are some reasons for treating sleep apnea? As mentioned previously, sleep apnea can be life threatening if not treated. Many people with the disorder can stop breathing completely for minutes at a time, or for many separate moments during sleep. At minimum, sleep apnea can also cause a wide range of health problems such as high blood pressure, stroke, heart failure, diabetes, and more. Primarily this is due to the fact that the heart has to pump harder and faster to compensate for the lack of oxygen it gets while breathing is interrupted. If you think sleep apnea doesn’t affect you, think again. According to the National Sleep Foundation, over 18 million American adults (or 5-20 percent of the adult population) have sleep apnea. While the figures for OSA in children are inconclusive, the group estimates that as many of 10-20% of habitually snoring children have the condition. Therefore, if you have sleep apnea—or even suspect that you might have it—it’s vital that you seek medical attention from a sleep apnea dentist in the Galleria area as soon as possible. In your initial visit, your sleep apnea dentist will likely conduct a series of tests designed to diagnose your specific sleep disorder and the best means of treating it. The dentist may offer a variety of treatment options, which may include lifestyle changes, mouthpieces, breathing devices, and surgery. With regard to lifestyle changes, you may be advised by your dentist to avoid or reduce your use of alcohol, cigarettes or tranquilizers. For overweight patients, the dentist may advise a weight-loss program that will reduce snoring and the possibility of interrupted breathing. Sleeping masks and dental devices are also viable options for CSA patients. Masks can keep a patient’s airways open while he or she sleeps, while dental devices gently tease the lower jaw forward in order to prevent airway blockage. Finally, surgery can prove a permanent solution for a small number of patients. An oral and maxillofacial surgery is performed to section the lower jaw and help pull the bone holding the tongue forward slightly. This surgery has an impressive success rate, which should reduce the anxiety of the patient who may need it. For more information about our sleep apnea dentist in Houston Galleria, please read the Sleep Apnea Dentist Houston page.